Individuals in support of the Standing Rock Sioux tribe, who believe the land is rightfully theirs due to an 1851 treaty, have been maced, tased, beaten with batons, shot with rubber bullets, and even sprayed down with water canons in freezing temperatures because they believe the DAPL’s construction will uproot burial ground and potentially contaminate the Missouri river. Energy Transfer Partners insists that the pipeline is incredibly safe, but betting on “human error” has proven to be too much of a risk, which is why advocates for the Standing Rock Sioux tribe protest. This past weekend, over three thousand veterans arrived at the Sacred Stone camp to show their support for the indigenous peoples’ plight, as well as to help prepare activists for the cold winter. Likely because of the veterans’ arrival – which was organized by Michael J. Wood, a former Baltimore police officer, the U.S. Army Corps of Engineers denied an easement to the oil companies responsible for the $3.7 billion pipeline. Cheers erupted in the camp as word spread, but a statement by Energy Transfer Partners soon made it clear that construction of the DAPL will continue regardless of the Obama Administration’s interference. As of now, a standoff continues between law enforcement workers and water protectors; those who are present at Standing Rock – and many more who intend to venture to North Dakota – are adamant that they are not going anywhere until the pipeline is rerouted. With heartache and humility in the air, veterans led by Wesley Clark Jr. did something remarkable today. 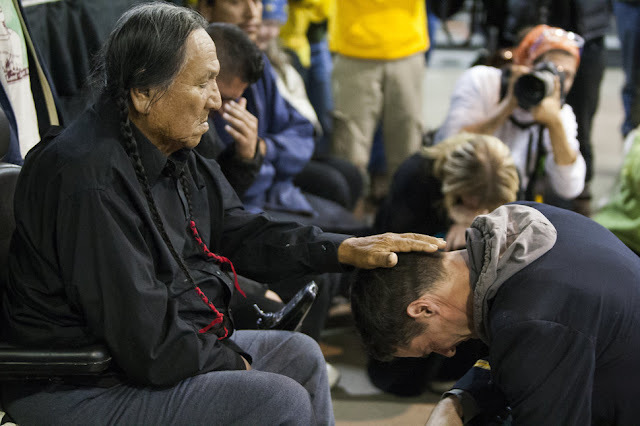 Hundreds of veterans gathered before tribal leaders of the Standing Rock Sioux tribe and begged for forgiveness for crimes committed toward indigenous people in the name of the U.S. military. The ceremony, according to Redhawk’s Facebook post, was led by Arvol Looking Horse, Leonard Crow Dog, Phyllis Young, Ivan Looking Horse, and a number of other natives of Turtle Island. Though many military personnel are in favor of the pipeline’s construction due to the potential boost it could offer the economy, others see it as another instance in which native Americans are being trampled upon within a two-hundred-year period. 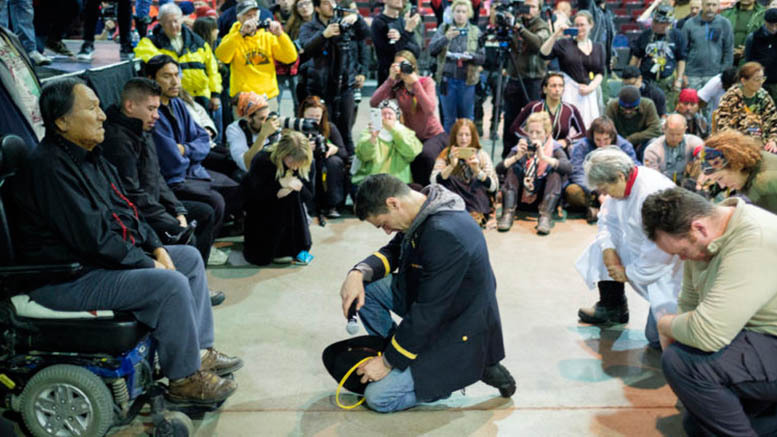 To attempt to ‘right’ the many wrongs of the past, the brave veterans asked for forgiveness. 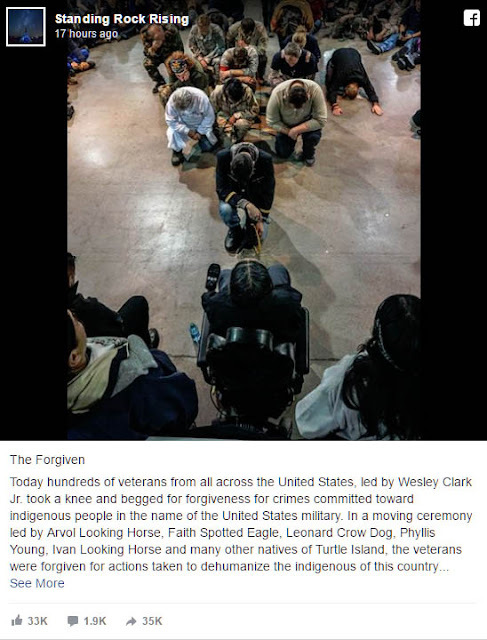 According to Jon Eagle, who is the tribal historic preservation officer for the Standing Rock Sioux, Leksi Leonard Crow Dog – a Sioux spokesman – forgave the veteran military members present for the past actions of their government. In turn, he asked for forgiveness for the Battle of Big Horn – also known as Custer’s Last Stand – when Sioux warriors killed approximately 268 U.S. soldiers affiliated with the 7th Cavalry.